I want to create a piano masterpiece! If you would like to be considered as an artist for the Klamath Piano Project, please read the following guidelines then complete the form at the bottom of this page (or you can download and print the form here). Please note before you apply - a drawing of your artwork design concept must be submitted with your application. Download the drawing template here and complete it prior to submitting your application (it must be submitted as part of the application). Klamath Falls Downtown Association seeks to involve local artists/teams by commissioning them to work with the Klamath Piano Project team to paint murals or otherwise artistically decorate working pianos. The artists will be required to work on the piano in its designated location in Downtown Klamath Falls. The intent of this project is to create a downtown attraction of an artist working on site and to place decorated pianos around the Downtown area. The artists/teams are required to develop and submit a visual concept for the mural to be painted or decoration to be added to a functioning piano. The Selection Committee will select multiple artists for this project. Questions concerning the scope of the project should be directed to Laty Xayavong, 541-539-0408. Questions regarding submittal or process should be directed to Darin Rutledge, 541-539-6212. Klamath Falls Downtown Association is requesting proposals for the Klamath Piano Project in an open competition for artists or artist teams to create painted murals or artwork on working upright pianos. The goal of this project is to create an interactive event where an artist/team works on site in a Downtown location. The project is looking for artists who can interact with the community while they are working on the piano and are able to create an exciting piece of artwork to inspire the community. The resulting artful piano will be placed in a public location in Downtown Klamath Falls, making art and music accessible for the community to enjoy. The project is looking for diversity in styles and concepts for the artwork with a preference for new and exciting ideas and emerging artists. Applicants are asked to create a concept drawing for the mural. Submit your concept image using the form at the end of this proposal request. We are looking for artwork that has an active composition with strong value contrast, minimizing large open spaces, reducing the opportunity for graffiti. We are looking for a range of themes, techniques, and experience levels. If painted, make the design picture based, not word-based. Designs that include logos, copyrighted or trademarked images, advertisements, or political, commercial, religious, or sexual symbols, themes or messages will not be accepted; however, special exceptions may be granted for logos that connect the community to existing themes, e.g., IHeartKFalls. Designs should be appropriate for a diverse, broad-based audience of all ages. The pianos need to function as musical instruments and be easily movable. Selected individuals/teams will receive a stipend to cover the cost of supplies. The artist will be required to create art on the piano in its Downtown location starting June 1, 2019. Each artist will have up to 13 days to complete their artwork, which must include weekend days. We are looking for artist(s) who can interact with the community while they are working on site. The pianos will be in a variety of sizes. The back of the piano will be covered with plywood, providing a solid surface on which to work. The pianos will be prepped (sanded and primed) prior to delivery to the location. All surfaces of the pianos will need to be painted/decorated. The pianos and artwork will become the property of Klamath Falls Downtown Association. In the event that the piano becomes permanently damaged by weather or other circumstance, it will be removed from the project. Pianos will continue to be reused/recycled and may be repainted by a different artist at a future date. Safety & Durability—Design must consider that the work will be situated in a public location and subject to the elements and potential vandalism. It must be durable and easily moveable, and depending on location, the back of the piano may be placed against a wall or other structure for stability. This project is open to all artists or artist teams. Teams can include school groups, clubs, organizations, etc. The artist or artist team leader/mentor must be at least 18 years of age. The artist(s) must be willing to work with the design team selected by the Klamath Piano Project and able to create their artwork on a piano in Downtown Klamath Falls, within an agreed upon time frame. Artists will start their work on June 1, 2019, and the piano must be completed and ready to play by June 8, 2019. The team is looking for artwork to be created on working pianos. The surface treatment must allow the piano to be tuned, played, and moved, and artwork is limited to the outside of the piano. Paint, etc., may not be applied inside the sound cabinet or on any of the mechanical parts of the piano (keys, soundboard, strings, etc.). The pianos will receive basic preparation (sanding & priming) prior to delivery to the location. Klamath Piano Project will provide a stipend to the artist to cover supplies and execution of all artwork selected. The amount of the stipend will be determined prior to artist selection based on total project funding. A selection committee will consist of members of the Klamath Piano Project committee and Klamath Falls Downtown Association board of directors. The selection committee reserves the right to reject any or all entries at any time in the review and selection process. If an artist’s preliminary concept is selected, Klamath Piano Project will assign a piano to decorate. Upon selection and final design approval, the artist must complete a contract with Klamath Falls Downtown Association. The artist will be responsible for the appropriate supervision of the persons participating in the project on their behalf. 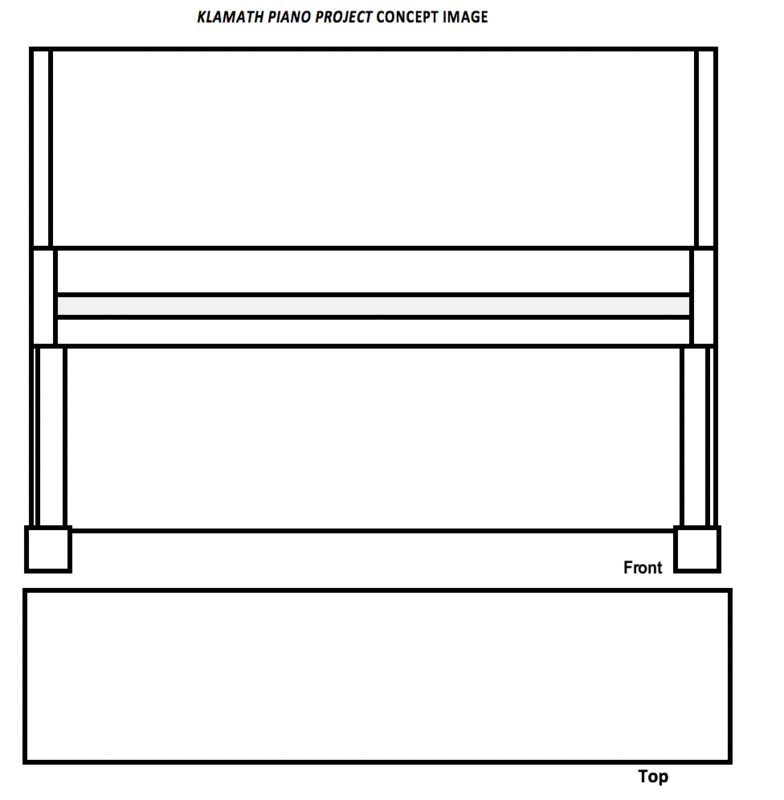 All finished work shall be faithful to the drawings, design, and concept as approved by the Klamath Piano Project committee. Progress reports and stipend will be made as contracted. All designs selected become the property of Klamath Falls Downtown Association. One full color concept image drawn, painted, or printed on the form at the end of this proposal request. Artists/teams can submit only one concept. Submissions must be complete or will not be reviewed. The Klamath Piano Project is not responsible for lost or damaged artist materials. Materials will not be returned. If you have read these guidelines and would like to apply to be considered as an artist, fill out the form below. Please tell us a bit about your proposed artwork. 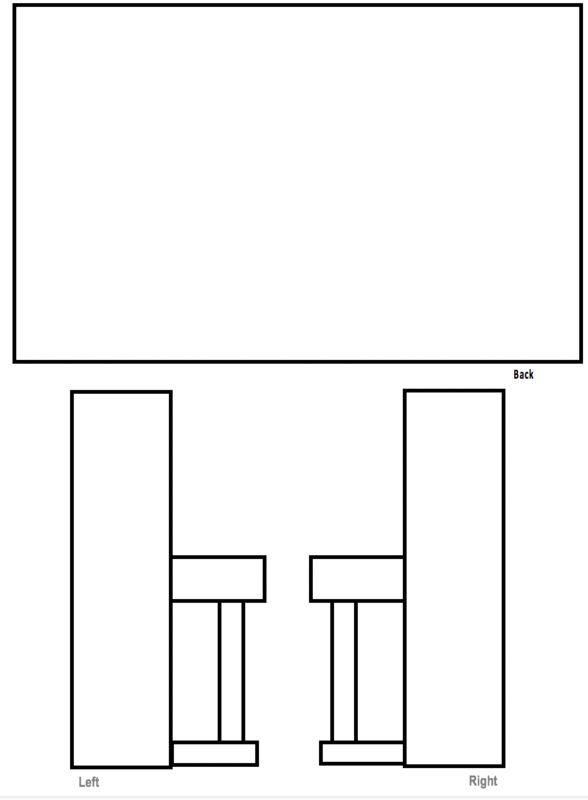 Please print the images below (or download the template here) and provide a graphic illustration of your artwork concept. The drawing does not need to be fully detailed, but should give the selection committee a visual representation of your concept. Once complete, upload a scanned image of the drawings. The Klamath Piano Project thanks you for your submission! We will contact you shortly after May 15.